This book had to be one of my most highly anticipated read of 2012. The premise for it sounded amazing and original and I can't even count the amount of positive reviews I read! I was so excited to read it! And somehow, even that simple cover drew me in. It seemed like this book would be something that I would enjoy very much, to put it frankly. Things start off with Ruby narrating how she got to this camp and vaguely giving details that she isn't like the other chicks at the camp. Oh, that was fine by me, but I guess things would get a little slow with all of that internal talk with herself. It wasn't necessarily a big deal, but there was that voice inside my head that would say 'Come on already . . .' But other than that, I connected with Ruby's character. I liked her. She was feisty, strong, and wore her heart on her sleeve. She would surprise me with the bite she would pack that would come up in situations, and with that, I knew that I would root for her through all of her darkest moments. Even if she was a little self-loathing. And a little too trusting every now and then. But, hey. Every great character has their flaws. What I absolutely loved about this book was that everything wasn't revealed immediately. Including the whole idea of show-don't-tell and master writing skills, the plot was engaging and kept me reading and reading. I don't think I've ever come across that many books where the answers weren't just handed to you on a silver platter, and those are probably the books I like most, anyway. And it just so happens that the mystery is pretty plot twisty and crazy good and hard to not finish reading. Speaking of plots, this baby never got old and boring, except for the beginning, where the flashbacks were exceptionally long (Not as long as the ending to The Daughter of Smoke and Bone, though). Plenty of characters are introduced and all of them have stories of their own and are very dimensional. On top of that, there's also plenty of action and adventure. There's escaping, running from the government, learning about the past, learning secrets, and much, much more. Everything is just all so exciting and energetic. And of course I'm going to discuss the romance because I just so happen to ship it so much. Also, yay for no love triangles! Woot! I do have to say that the romance does take a backseat, but it was still a good romance. Liam was the little charmer and absolutely adorable! He was a sweet dude, and while he also had his faults, including self-loathing and a huge case martyrdom, he was an awesome character. Even if he wasn't the love interest, he was a fantastic character. Not my top favorite, however, because Zu holds that spot. I've read amazing books. Simply great books. But the writing could be absolute nothing. Not to say that they have terrible writing, but there's nothing about it that screams that it's something individual and expressive. They're almost detached in the way that they're written. However, Bracken's writing was something so beautiful and talented. I absolutely loved her writing style! For a while, I was reading okay, but not exceptional books, and I was so glad I picked The Darkest Minds up. I only wish that I would have read it sooner! 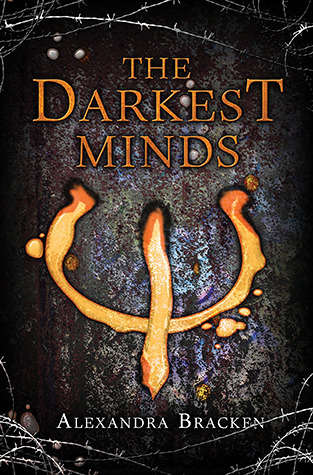 The Darkest Minds was a gritty and dark book about a corrupt government that's taken control of the 'gifted' children. Nothing seems fair in this futuristic world and some of these children are ready to fight back. Bracken's writing was poetic and Ruby's story just made for an incredible story to be told. The characters were dimensional and real, the story was intense, and the writing was phenomenal. If you haven't read this book already, I suggest you do--and fast--because it would be a mistake not to.